This Premium Holiday Celebration at Disney’s Hollywood Studios includes reserved viewing in Premiere Theater for the "For the First Time in Forever: A Frozen Sing-Along Celebration. 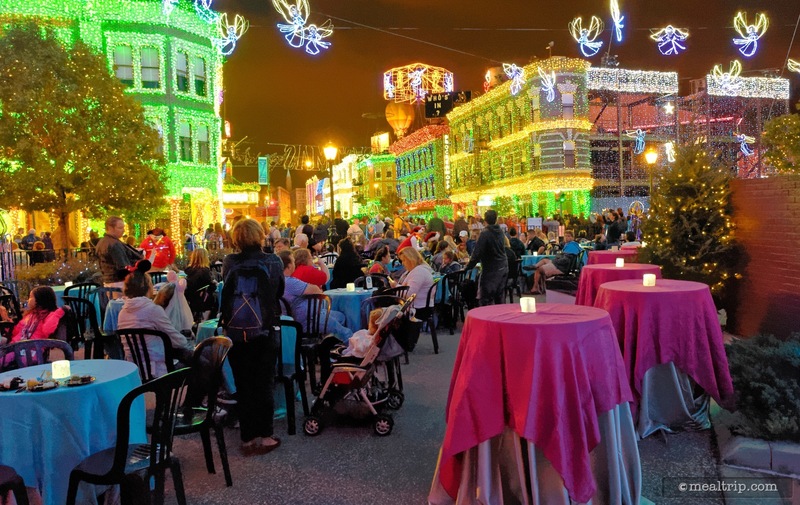 ", live stage show, and viewing of the Osborne Family Spectacle of Dancing Lights from a reserved location at the end of the Streets of America, (the Lights, Motor, Action side of the street). 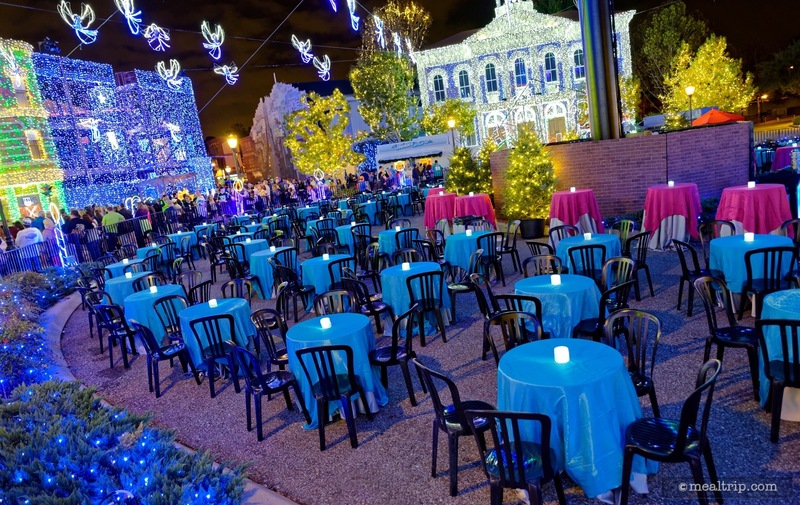 Also in the reserved viewing area for the Osborne Lights, a Frozen themed dessert party will be taking place, with specialty beverages (alcoholic and non-alcoholic) along with Frozen themed desserts. Those attending will also receive a special holiday lithograph and Frozen pin. The package cost is $89 per adult or $59 for children ages 3 to 9, and does not include admission into Hollywood Studios itself. The package was offered from November 7 to November 19, 2014; November 21 to December 9, 2014; and December 11, 2014 to January 4, 2015. For more information or to purchase tickets, please call (407) 939-1854. 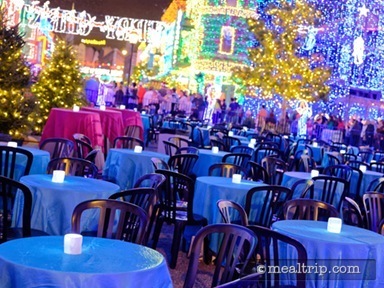 The Frozen Premium Package "Holiday" Event includes reserved seating at one of the day's "For the First Time in Forever: Sing-Along" shows that take place in Hollywood Studio's Premiere Theater, and a special dessert party mash-up that's part holiday, part Osborne Lights, and part Frozen. The reserved seating at the sing-along part of the package is very similar to the "Spring" premium package that was offered earlier in the year. The seats are good, and the show itself is entertaining as well. Even if you have heard the songs too many times, the show's two hosts do a great job of adding little nuggets of family-friendly comedy that provide a wink and nod to the audience's parents. That, along with the quick pace of the show, keep everyone in the audience interested for the duration. We're a food blog though, and so it's time to talk about the dessert party portion of the package. On good weather nights, the party takes place directly under the giant "angel globe" in the teardrop area at the end of the Avenue of the Americas... basically, in front of the "Lights, Motors, Action" entrance... and offers an amazing view of the Osborne Family Lights. 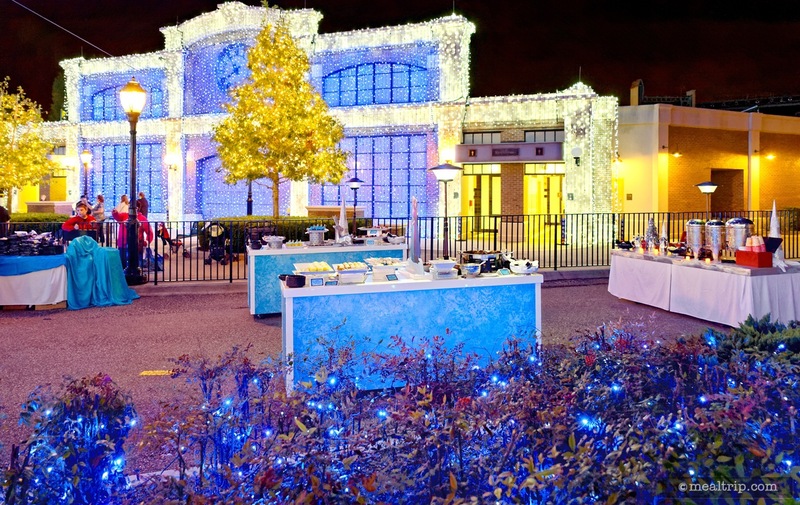 On even slightly temperamental weather nights, the desserts are all moved to the covered "Studio Catering Company" location, which offers no view of the Osborne lights whatsoever. 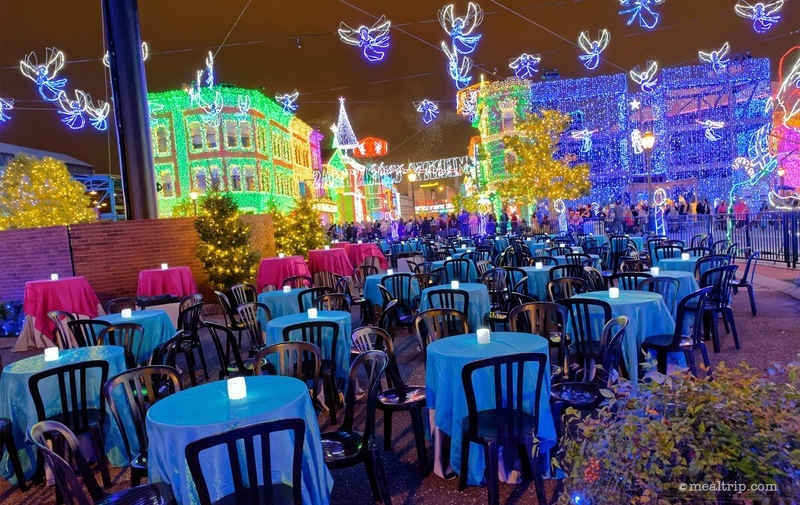 Not even Disney can control the weather, and you have to go with safety first of course... but not being able to see the lights while you enjoy the desserts really detracts from the experience. 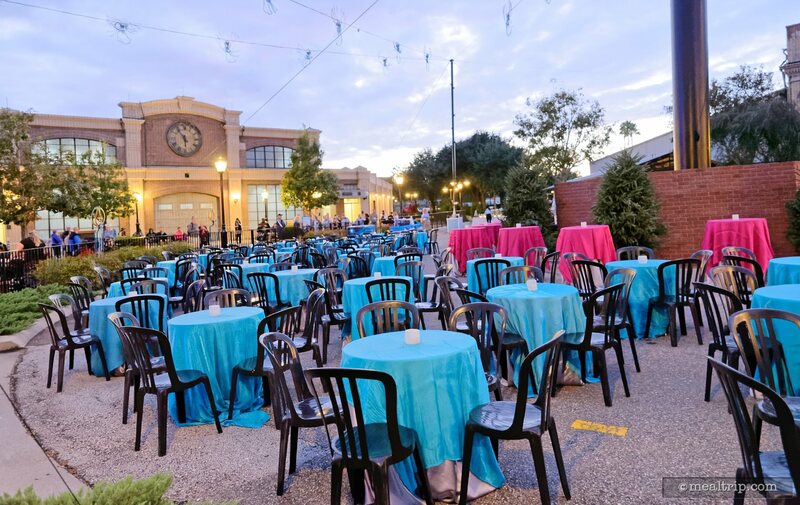 I was fortunate enough to go on a great weather night and I think we've added some great photos of the setup area to the Mealtrip system. Getting to sit directly under a main element of the display, without being knocked around in the crowded Avenue of the Americas can be a priceless experience. It's how the lights should be experienced. All of the edible elements of the party are all you care to eat (and drink), so once you're in... make sure you try everything, and feel free to go back for seconds (and thirds) of your favorites. There are alcoholic and non-alcoholic versions of the three "party" drinks, along with sodas, juices, a coffee and tea station, and water. 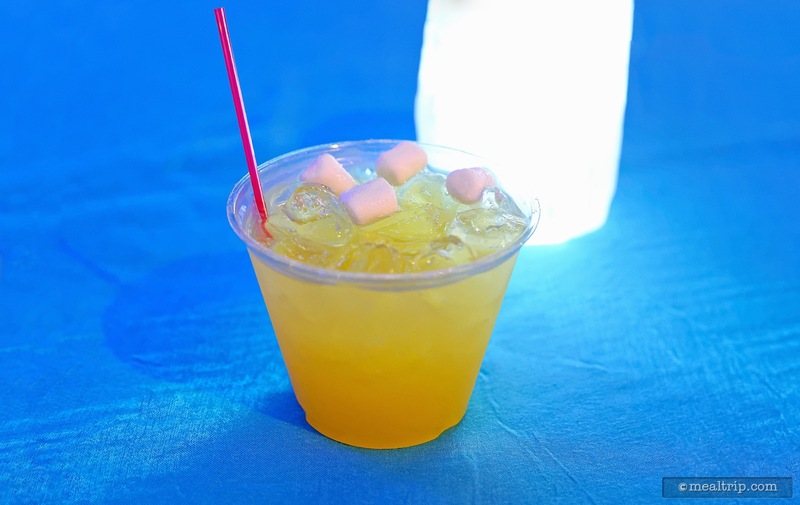 The three party drinks included "Kristoff’s Icy Summer" (coconut rum and pineapple juice), the "Southern Isles Cider" (bourbon and apple juice), and the "Peppermint Sauna Hot Chocolate" (hot chocolate and Bailey’s Irish Cream). While not being award winning, complex cocktails, the "adult" party beverage were perfectly acceptable for a large guest party. 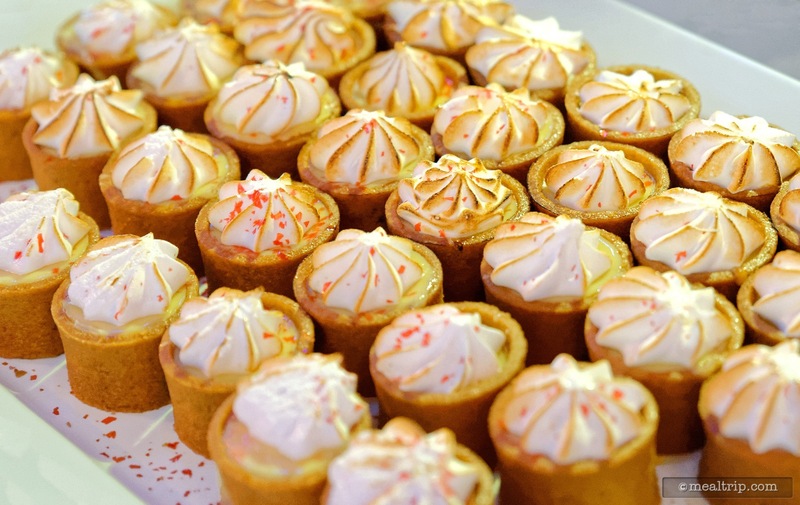 The desserts, also seemed to be geared to the masses, and not all that different than the mini dessert that you might find at any of the park's buffet dessert stations. 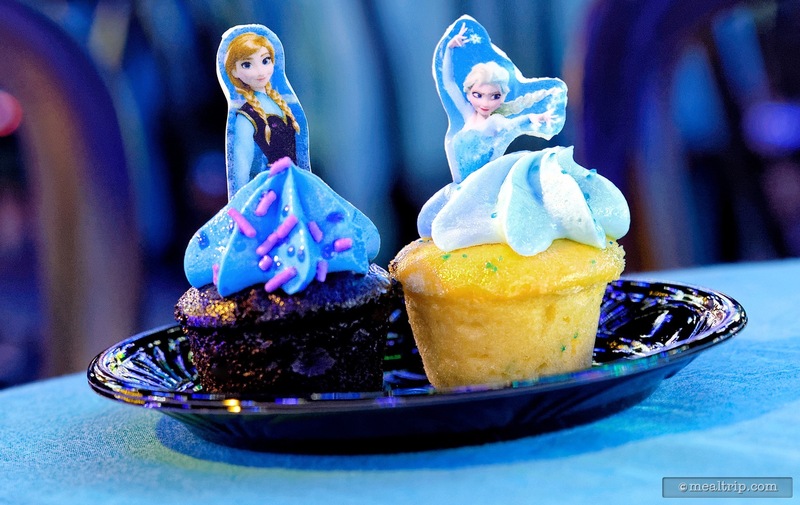 Selections included the necessary Anna and Elsa mini Cupcakes (vanilla and chocolate with standard frosting), and Olaf Cake Pops that combined a Carrot Cake and a Chocolate Cake "body" parts covered in frosting. 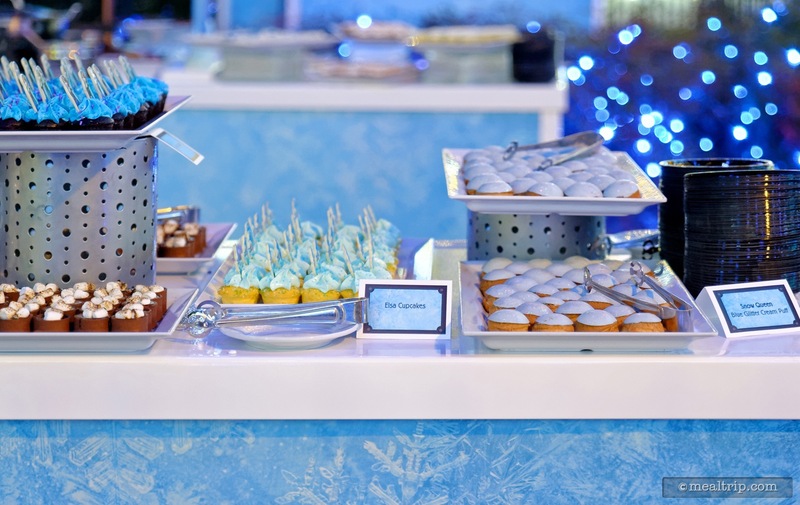 Key Lime Tarts, Chocolate S’mores Tarts, blue glittery Cream Puffs, and "Living Rock Bon Bons" (which are small Krispy Treats with colored chocolate-like topping and sprinkles), round out the "mini" desserts. 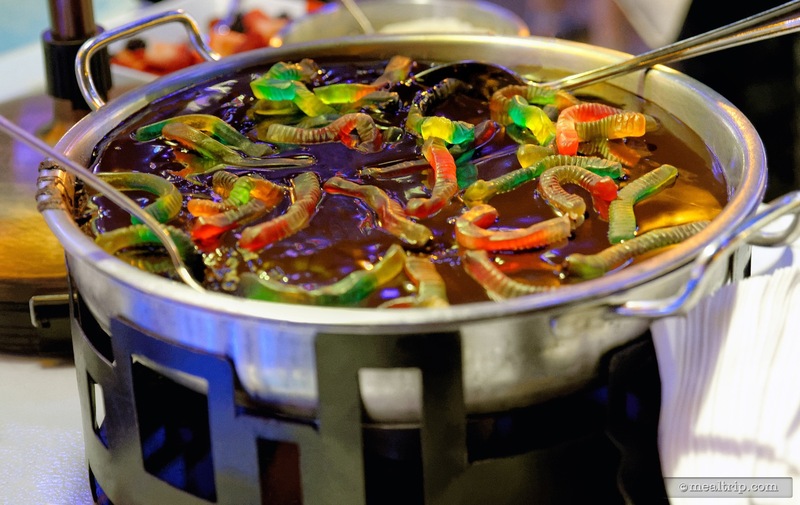 There was a warm, chocolate, worms-in-dirt inspired tray of goo, with colored gummy worms, whipped cream, and a few berries that could be used as "toppings". It looked... clumpy, and while I did pick up the giant self-serve spoon, a helping never made it to my plate. The brown stuff just didn't fit theme-wise, and didn't really look all that appetizing. 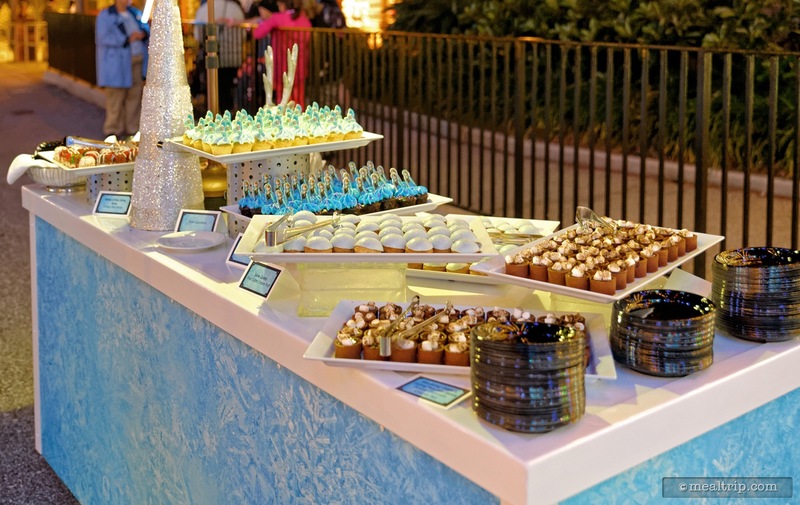 An ice cream cart was also parked by the entrance of the event space offering Mickey's Ice Cream Bars, chocolate covered frozen bananas, Mango and Strawberry juice bars, Mickey's Ice Cream Sandwiches, and Olaf's new Frozen Lemonade Strawberry Bar. 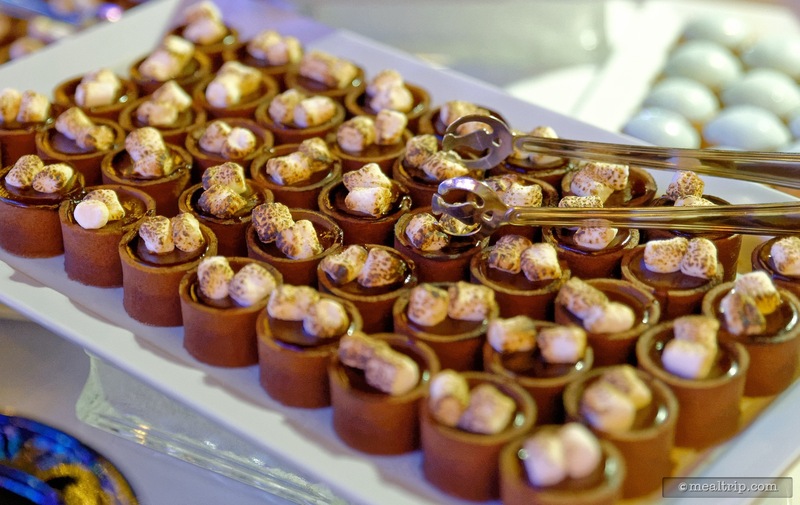 All in all, a nice collection of desserts, but nothing that really stood out as being unique to this dessert party. I like seeing a few offerings that are special to each of these "added cost" events, that you can't get anywhere else. 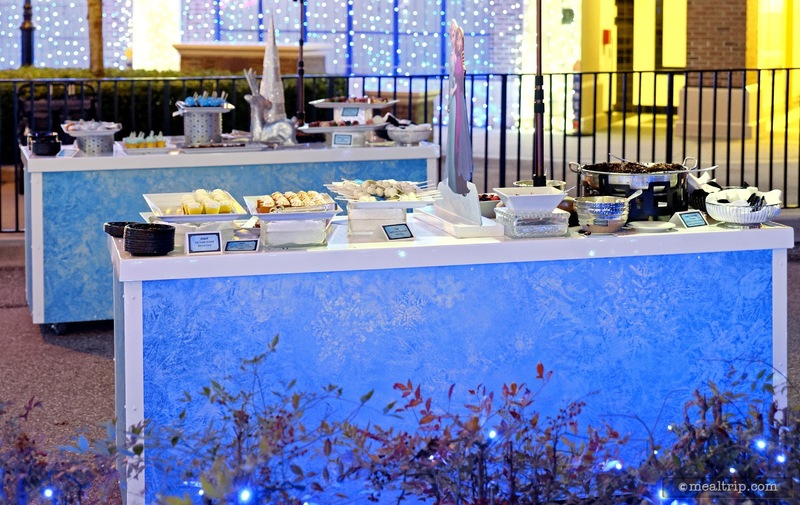 The summertime version of the Frozen Dessert Package offered a cheesecake push-pop that included mango boba beads in the middle, and a warm fondue station where a cast member would drape a warm chocolate sauce over a plate of fruit, marshmallows, nuts and other goodies that you had plated yourself. 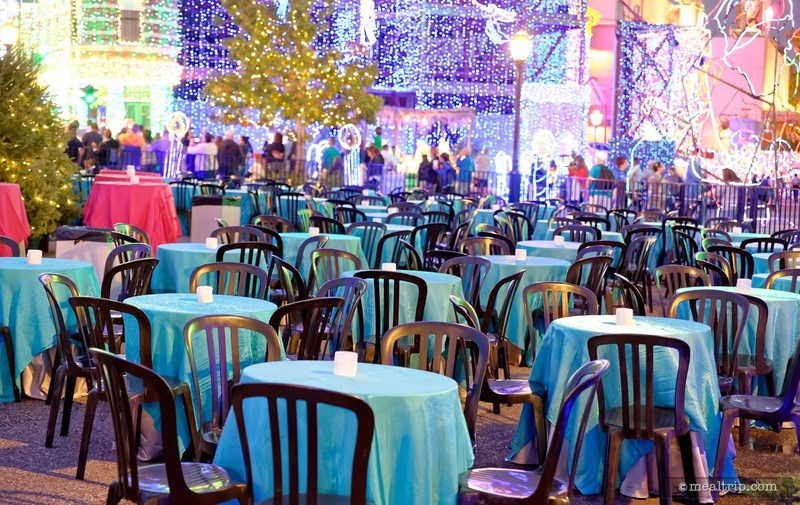 Little touches like that, seem to be missing from this "winter" version of the Frozen dessert party. At the end of the evening (or any time, really), a small piece of your plastic credential lanyard can be snapped off and exchanged for a lithograph of the Osborne Family lights, and a limited release Frozen pin. 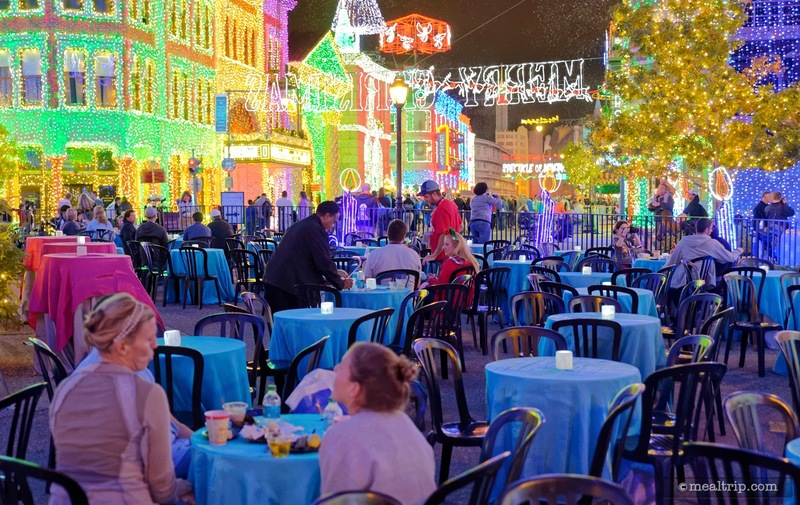 If the weather is good, and you get to sit under part of the Osborne Family lights, while enjoying the rest of the display down the street, at your own table... the experience is very cool and memorable. The drinks and dessert are acceptable, but they're not really going to do anything for those looking for more epicurean delights. If the weather is questionable though, and the party is moved under cover, and away from any direct sight-line to the holiday lights, you might question the value of the whole package. This is one of those events where the location of the party, can really impact the whole package. CLICK HERE to view all 31 images in our photo gallery.